[JUNE 15, 2002] Harrison and Nola Turley are observing their 50th wedding anniversary with a reception hosted by couple’s children. The event will be at the Lincoln Park District facility on Primm Road at 4:30 p.m. Saturday. Friends and relatives are invited; no local invitations are being sent. 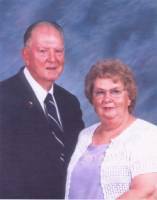 Harrison Turley and Nola Willmert were married June 14, 1952, in Searcy, Ark. The best man was Ted Boward, and the maid of honor was Iona Boward, sister of the bride. Children of the Turleys are Darnell (and Rhonda) Turley of Cantonment, Fla.; Rhonda (and Greg) Manus of San Jose; Randy (and Tina) Turley of Clinton; Cinda (and Jerry) Lubich of Litchfield; Kevin Turley of Lincoln; Mark Turley of Nashville, Tenn.; and Gerian Rahn of Lincoln. Grandchildren of the couple are Brett Turley, Brenda (and Mike) Meagher, Bryan Jackson, Jennifer (and Brett) Routson, Kyle Shaub, Adam, Chase, Spencer and Madyson Turley, Chad (and Julie), Kelsey and Kiersten Foss, Jason and Jill Lubich, Stephanie and Joshua Turley, Jessica and Erin Turley, Rian Welles, and Bradley, Mark and Shannon Rahn. Kaitlyn and Kirkland Routson and Julie Meagher are great-grandchildren of the Turleys. Harrison retired from Pittsburgh Plate Glass, where he was an electrician. He is currently employed at the Lincoln Park District. Nola was a cook at Lincoln Community High School and retired from that position. She is now an administrative assistant for First Baptist Church and is also employed by the Lincoln Park District. [JUNE 15, 2002] Habitat for Humanity will have an orientation session for people interested in applying for a Habitat home. The meeting will begin at 7 p.m. Thursday, June 20, at Good Shepherd Lutheran Church, 1140 N. State St. in Lincoln. This is the first step in applying for home ownership. • Have a need for a decent house and not be able to purchase a home with conventional financing. • Have lived in Logan County for at least two years. • Have a stable income and a history of financial responsibility. • Be willing to invest time in helping to build either their home or homes for other applicants. • Be able to make a $500 down payment. • Be willing to develop skills needed for home maintenance. Habitat for Humanity is a nonprofit, ecumenical Christian housing organization that works in partnership with people in need of affordable housing. Houses are built by volunteers, including the prospective homeowners, using donations of money and materials. The homes are sold to those selected at no profit and with no interest charged. The payments homeowners make are used to build more houses for others who need them. Logan County Habitat for Humanity is a part of the international organization.